Former US President Barack Obama waves as he concludes his town hall for the Obama Foundation at the African Leadership Academy in Johannesburg, South Africa, Wednesday, July 18, 2018. South Africans along with former U.S. President Barack Obama were marking the centennial of anti-apartheid leader Nelson Mandela's birth on Wednesday with acts of charity in a country still struggling with deep economic inequality 24 years after the end of white minority rule. 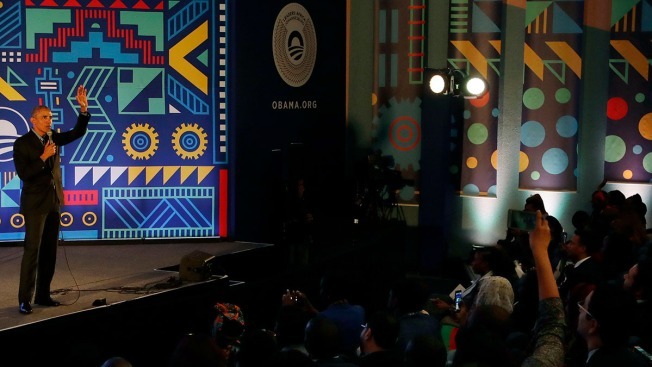 Obama met with young leaders from around Africa to mark the anniversary, a day after he delivered a spirited speech in Johannesburg about Mandela's legacy of tolerance and criticized President Donald Trump and his policies without mentioning him by name. An enthusiastic crowd of 14,000 gave Obama a standing ovation for his address, the highest-profile one since he left office. "Most people think of Mandela as an older man with hair like mine," the 56-year-old, grey-haired Obama said to laughter from his audience on Wednesday. Former President Barack Obama condemned the current state of American politics while not mentioning President Donald Trump by name during a speech to honor the late Nelson Mandela in South Africa. But he added that people forget that Mandela "started as a very young man, at your age, trying to liberate this country." South Africans and others around the world marked the July 18, 1918 birth of Mandela with clinic openings, blanket handouts and other charitable acts. In Cape Town, numbers were painted on homes in one of the sprawling slums to help health workers locate people living with HIV and tuberculosis. After 27 years in prison in South Africa, Mandela was released in 1990 and became the country's first black president four years later. He died in 2013 at the age of 95.